(SPOT.ph) The big “I do” is a major milestone for any couple. While some prefer a low-key and understated affair, others go all out for their special day—including many of your favorite celebrities. 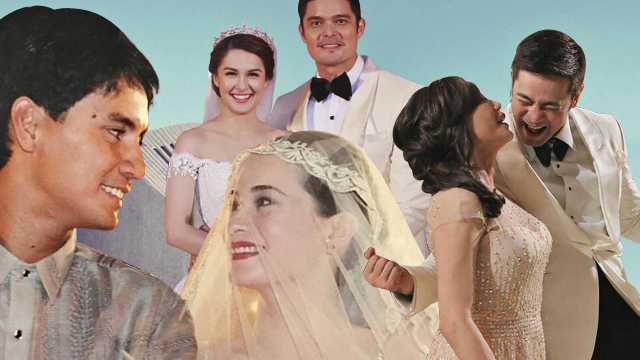 We look back at some of the biggest and most extravagant showbiz nuptials over the past few decades, from former love-team pairings to even politicians. Easily one of the most talked-about weddings of the year, Hayden Kho and Vicki Belo’s weekend nuptials were jaw-dropping from start to finish. They kicked everything off with a cruise on a yacht in the River Seine, followed by the actual ceremony at The American Church in Paris, then an opulent reception held at the stunning and historic Opéra Nacional de Paris - Palais Garnier. According to an extensive report by PEP.ph, the entire affair took about a year to prepare with 250 guests, 400 crew members, and 28 artists. The grand total? A whopping P80 million! Dubbed the “Royal Wedding” in 2014, the “Primetime King and Queen” exchanged vows at the Immaculate Conception Cathedral in Quezon City, with a massive LCD screen set up outside the venue for fans outside. 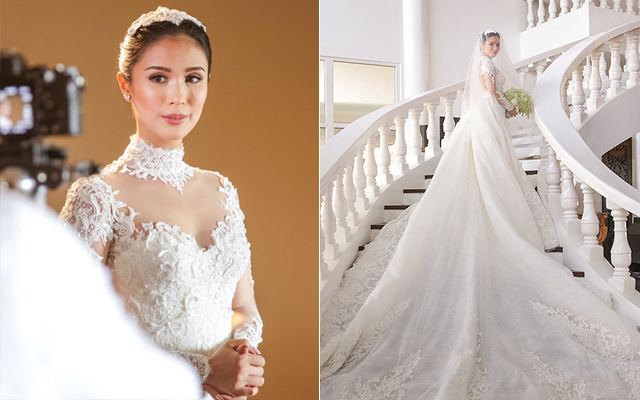 The only thing more glittery than their guest list (which included then-President Benigno Aquino III, Vilma Santos, Kris Aquino, and Ben Chan) was Marian’s P2 million-lace gown by Michael Cinco. The reception was held at the Mall of Asia Arena, which also housed their 12-foot wedding cake and a special short film by director Joyce Bernal. It was a love story that began on the set of a Lux commercial. Their fairytale wedding took place at the Saints Peter and Paul Church in Lucy’s hometown of Ormoc, Leyte. The pre-wedding prep famously included commemorative shirts for fans that said, “I was there at the Richard-Lucy wedding, Ormoc City, April 28, 1998." As for guests' giveaways, Lucy prepared a 16-song mixtape comprising handpicked tracks that were special to their relationship. The couple reportedly had three receptions: One for the workers of the Torres family’s hacienda, a motorcade and party for 1,000 guests at the Ormoc Super Dome for local residents and fans, and a simultaneous reception for the actual wedding guests. For this celebrity wedding, celebrations began with a three-day golf tournament at Camp John Hay in Baguio City with fellow showbiz personalities. Their actual ceremony at the St. Joseph the Worker Parish was televised live and had an impressive entourage that included Fernando Poe Jr., Sen. Loren Legarda, Vilma Santos, Lily Monteverde, Charo Santos-Concio, and ABS-CBN chairman Gabby Lopez. 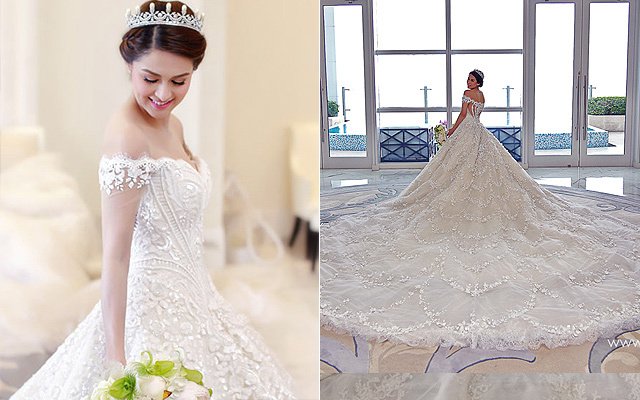 Charlene looked radiant as she walked down the aisle in an off-shoulder number with a four-meter train. The seven-layer wedding cake was the reception’s scene-stealing centerpiece, created by the bride’s mother over the span of seven months. It was a reel-to-real love story that began in 1981 with Dear Heart, eight more films, and finally, a lavish wedding for Gabby and Sharon. Nobody seemed to mind that they were only 19 at the time; thousands of frenzied fans gathered outside the Manila Cathedral and the Philippine Plaza just to catch a glimpse of the popular love team. The ceremony and reception reportedly had excessively strict security, which wasn’t a surprise considering the couple’s popularity and then-President Ferdinand Marcos as principal sponsor. This couple’s posh wedding weekend took place at Balesin Island, beginning with a celebration of Heart’s birthday and despedida de soltera; the event also served as a welcome party for the star-studded guest list of celebrities, politicians, and businessmen. The already-stunning venue was transformed into a sea of white, with a canopy of 5,000 stems of White wisteria and 100 pieces of crystal. The bride’s Grace Kelly-inspired frock was also a show-stopper, featuring a detachable five-meter train, an intricate bodice, and 70,000 Swarovski crystals. The couple held two receptions: One at Balesin, and another in Manila for guests who couldn’t make it to the island ceremony. What do you get when a senator and a broadcast journalist tie the knot? Easily one of the swankiest and talked-about weddings of the year. Although the political timing wasn’t lost on several observers—a month before Mar was expected to file candidacy to run as vice president—an estimated 3,000 guests still filled the Sto. Domingo Church, a mix of political and showbiz personalities. Outside, a crowd of 2,000 people witnessed the Filipiana-themed event via four giant television screens in the churchyard. The couple decided to forego what would have been a P3 million reception at the Araneta Coliseum (where they supposedly had their first date), and donated the funds to typhoon victims instead. This whirlwind romance was the talk of the town even before the bride walked down the aisle. 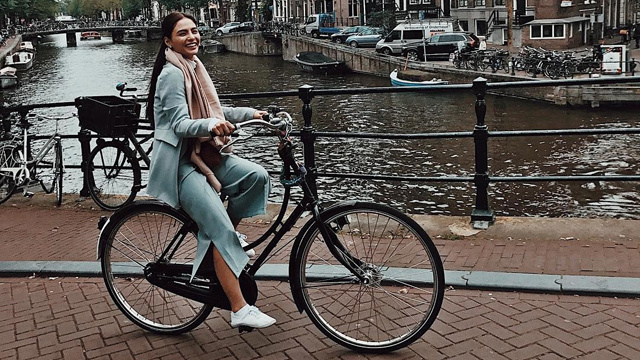 Her family publicly opposed the then-19-year-old actress’ live-in relationship with the 41-year-old congressman from Negros Occidental. 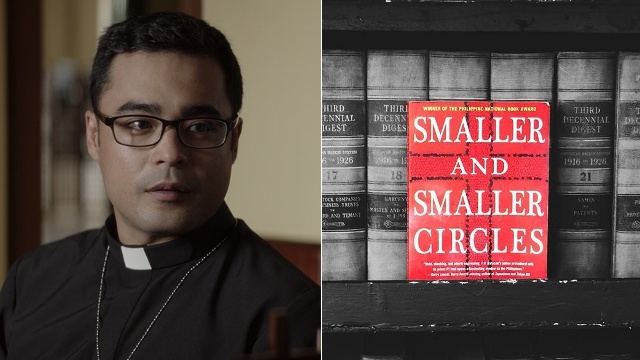 They were married twice, first in a grandiose civil ceremony that was aired on ABS-CBN and two years later, an actual ceremony at Sanctuario de San Antonio. The latter served as a reunion for the bride and her estranged family and the guests were less showbiz and more high-society and political personalities. The reception was held at the Rizal Ballroom of Makati Shangri-La, which housed 700 guests.